After defending SOTU invite to Holocaust denier, is Florida Rep. Matt Gaetz in trouble? Freshman Northwest Florida Republican Congressman Matt Gaetz suddenly finds himself defending a ticket he gave to a controversial alt-right news troll and alleged Holocaust denier, Charles “Chuck” Johnson. After inviting Johnson to sit in the Congressional visitors gallery during President Donald Trump’s State of the Union address, his comments defending that action erupted in criticism from local and national media. That also consternated his generally supportive conservative constituents in the predominately Republican 1st Congressional District. Some are perplexed, calling his exculpatory comments “inexplicable and reprehensible.” There is even discussion about a possible Republican primary battle for his seat in the 2018 midterm elections. The irony is that Gaetz is also an Israel supporter. He briefed local AIPAC supporters upon his return from a Congressional trip that met with Israeli Prime Minister Benjamin Netanyahu in August 2017. But that is not the only controversy. Gaetz has achieved national media prominence in calling for the firing of Special Prosecutor and former FBI chief Robert Mueller on the grounds of selecting FBI investigators with alleged Democratic biases who made contributions to the Clinton Foundation. He suggested during a recent MSNBC interview that he had no problem with Mueller’s qualifications. Rather, Gaetz suggested that Mueller should have made better picks from the pool of available non-partisan prosecutors. Gaetz defended his action in a Facebook interview with Jim Little of the Pensacola News Journal, referencing his chairmanship of a Florida House committee that enhanced prosecution standards for human trafficking. But then he put a peculiar spin on his lone no vote decision on the bi-partisan Congressional human trafficking legislation. “Gaetz said he voted no because, despite best intentions of the bill, it represented ‘mission creep’ at the federal level in creating the committee. “Unless there is an overwhelming, compelling reason that our existing agencies in the federal government can't handle that problem, I vote no because voters in Northwest Florida did not send me to Washington to go and create more federal government," Gaetz said. "If anything, we should be abolishing a lot of the agencies at the federal level like the Department of Education, like the EPA and sending that power back to our state governments." Dosev, given this latest kerfuffle over the invite to alt-right troll and Holocaust denier Chuck Johnson, is gathering petition signatures for an April 2 deadline to force an open Republican primary contest with Gaetz. “So a congressman and a white supremacist walk into the State of the Union… It actually happened, thanks to Northwest Florida’s … U.S. Rep. Matt Gaetz… Did anyone know they were getting a congressman who would hang out with radio hosts like Alex Jones [of Info Wars] who deny school shootings, moon landings and the Sept. 11 attacks? Gaetz also denied that Johnson had denied the Holocaust. During his interview with Jake Tapper on CNN, Gaetz alleged that Johnson had made contributions to a foundation established by the late Elie Wiesel. Further, he defended his InfoWars appearance with host Alex Jones as someone who has to go on these extremist programs to get the truth told. Gaetz insisted. "But I think that when… we only talk to audiences or people that agree with us, I think we end up in a myopic state of politics." On Feb. 5, Gaetz was interviewed on Andrew McKay’s “Morning Newsmaker/News Shaker” program on Pensacola’s News Radio 1620. When questioned about the kerfuffle erupting from his invitation to Johnson, Gaetz apologized for his lack of due diligence on Johnson’s background, who allegedly was referred to him by another Congressman. When McKay pressed him for the identity of the Congressional colleague, Gaetz demurred. Gaetz then proceeded to invoke Alfred Balitzer, a founder of the Republican Jewish Coalition, saying that he had written to the Congressman indicating that he never heard Johnson denying the Holocaust. Gaetz said he was awaiting a similar statement from Harvard law professor emeritus Alan Dershowitz. How did Gaetz get elected to his first term? Elected on Nov. 8, 2016 in the tumult of Trump’s national electoral victory, Gaetz had been on stage during Trump’s multiple visits to Pensacola. Gaetz is the scion of a powerful political dynasty. His father, Don Gaetz, is a former Florida Senate president. The younger Gaetz ran for his father’s vacated Florida House seat and was elected in 2010, serving three consecutive terms. His only controversy was his 2008 DUI arrest. 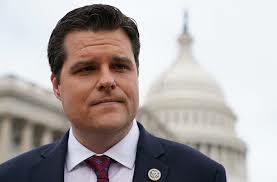 Based on the Cook Partisan Voting Index, Florida’s first Congressional district is the most Republican district in Florida, 15th in the U.S. Because of the significant U.S. Navy and Air Force military bases in his district, Gaetz is a member of the House Armed Services, as well as Budget and Judiciary Committees. Will 35-year-old Matt Gaetz politically survive this kerfuffle? What happens when local AIPAC members encounter him at the Washington Policy Conference next month? Will he become Mr. Teflon due to his loyalty to President Trump and skate through this current crisis? Stay tuned for developments. Jerome B. Gordon is a senior editor of The New English Review and a registered voter in Northwest Florida’s 1st Congressional district. An earlier version of this article was published in the Jerusalem Post. Southern Jewish Life: After defending SOTU invite to Holocaust denier, is Florida Rep. Matt Gaetz in trouble?